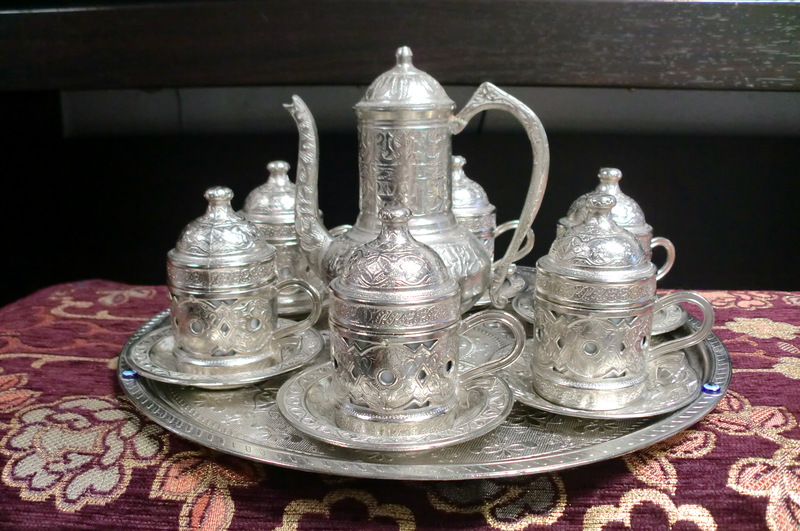 This pretty Turkish silver coffee set was purchased for me in Istanbul when hubby and daughter were in Turkey recently. It’s not really silver. Its copper with a nickel plating over it which gives it the appearance of real silver and has the additional advantage of not tarnishing. 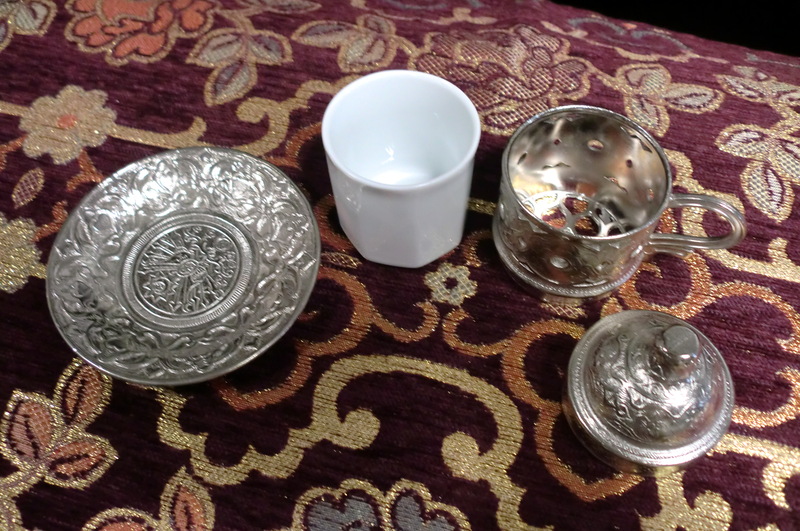 But it’s virtually indistinguishable from my real silver pieces. I love the look of this little set even though I probably won’t use it very much to make coffee in. 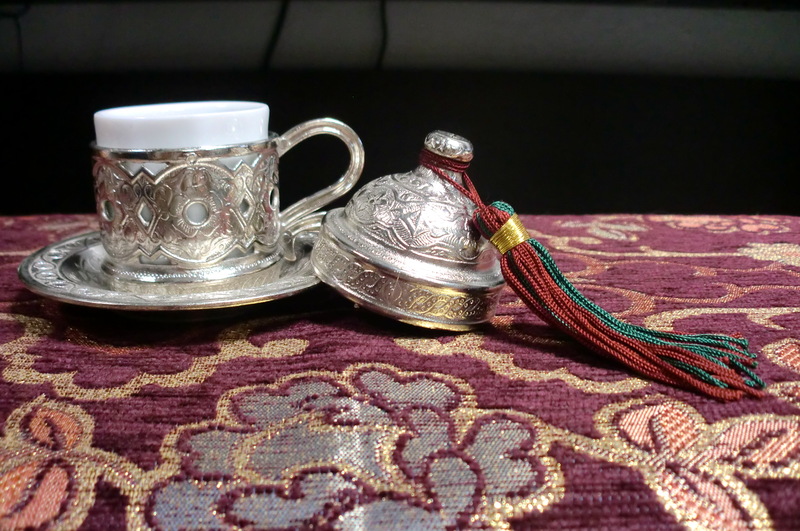 I’m not overly fond of the strong, thick, unfiltered and boiled Turkish coffee and I must sheepishly admit that I much prefer wuss style coffee. (AKA the filtered drip method) These delicate little cup holders come with a small porcelain cup inside but they can also be used for tea by just substituting the coffee cup for a thin tall tea glass and placing it in the holder. Each holder comes with a removable little porcelain cup and a lid to keep the coffee hot. 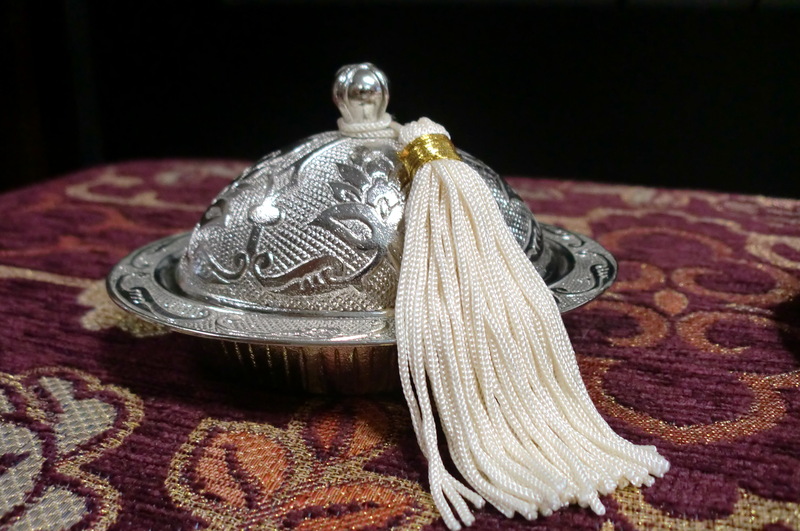 I had some small chainette tassels in a baggie that I had bought years ago on Ebay. 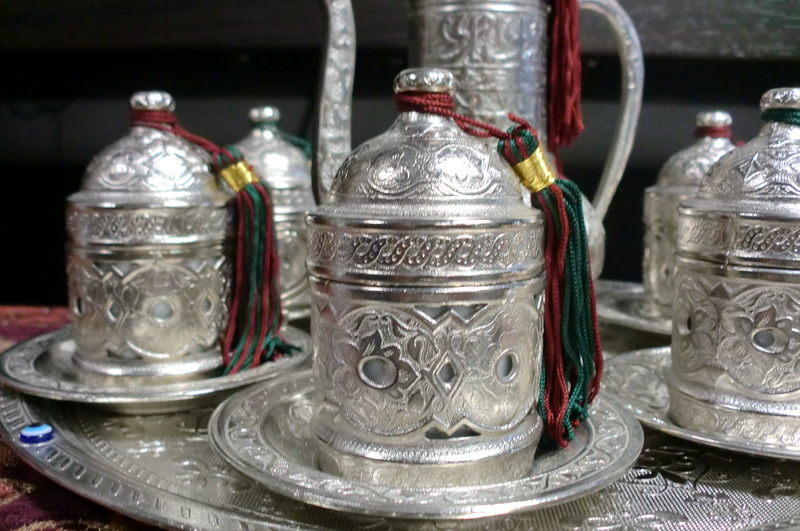 They look cute hung from the finial on the lids…kind of like little Fez hats. 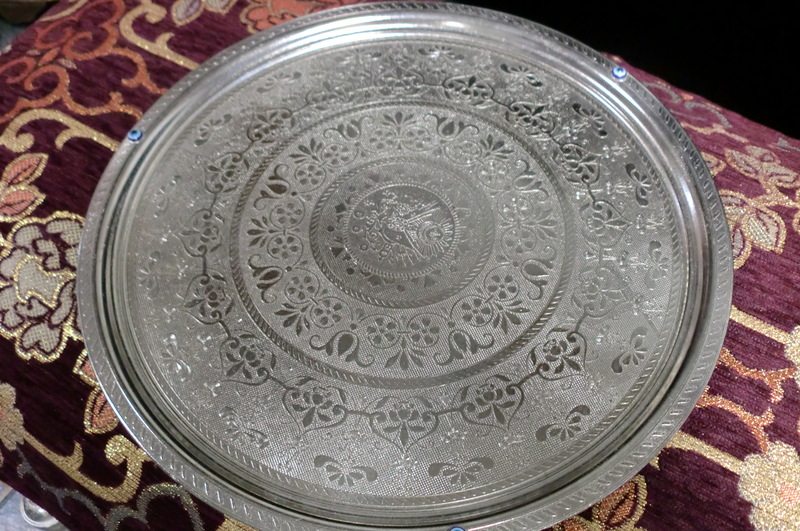 This oval shaped piece is called a Delight Dish. 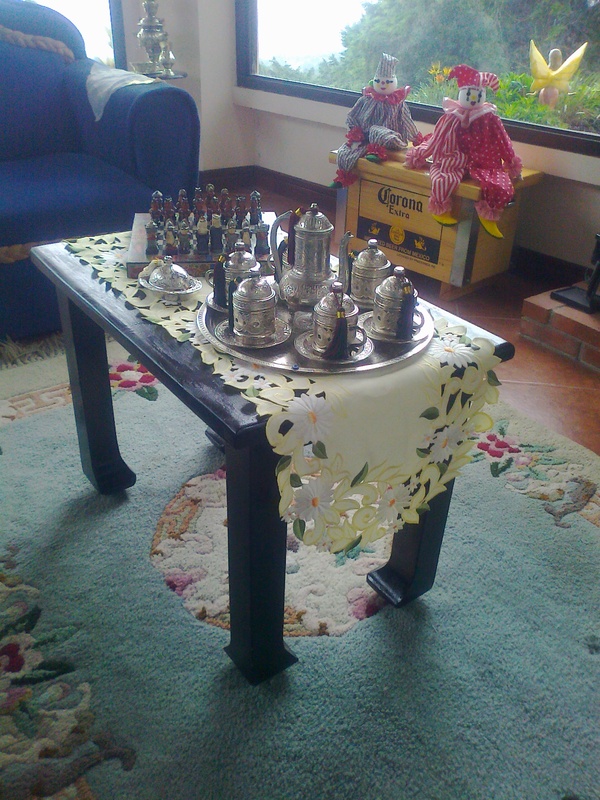 It’s used for serving Turkish Delight along with the coffee. It can also be used as a small sugar bowl, though it won’t hold very much sugar. It would probably work better as a Splenda packet holder. 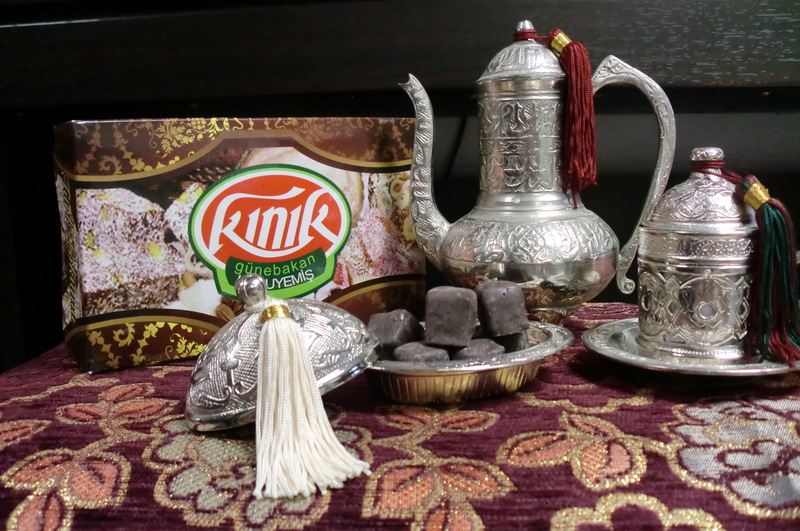 My daughter brought me boxes and boxes of Turkish Delight. They were everywhere at the Grand Bazaar. You can purchase them either already boxed and packaged or you can buy them fresh and they will package them for you right there. 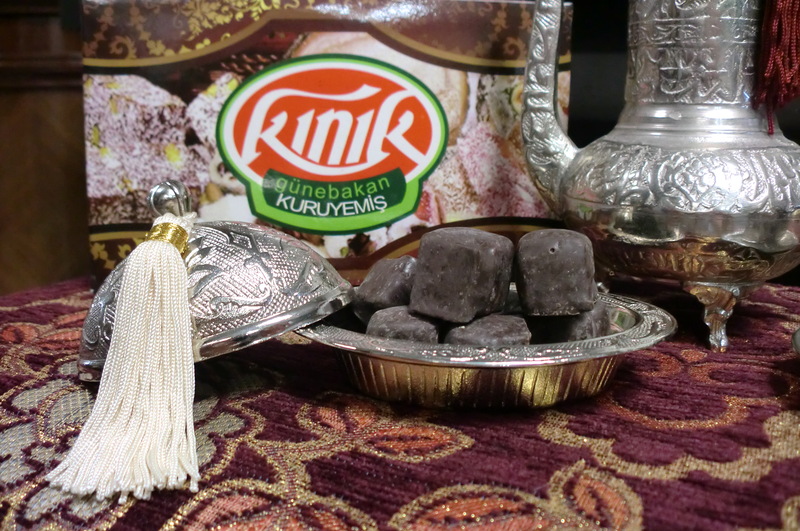 These are fresh chocolate covered Turkish Delight. Mmmmm. Heaven in a box. 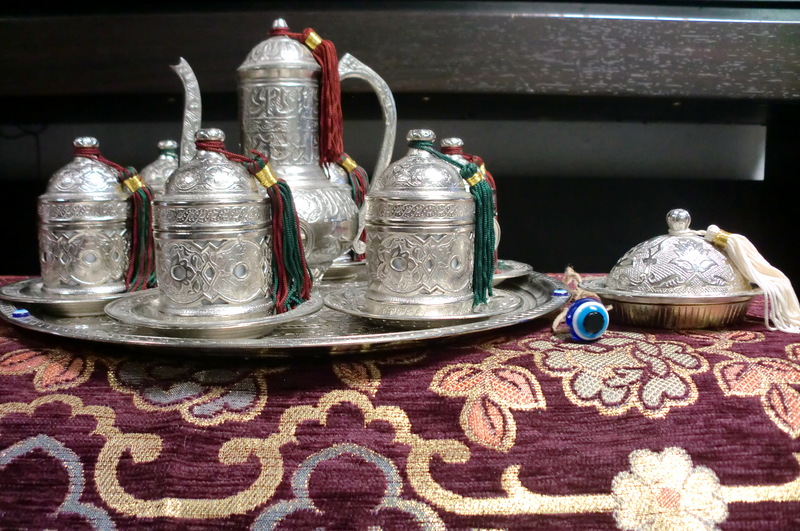 The tray has little blue “evil eye” amulets all around the rim. I guess these amulets will come in handy as protection against the evil eye that I will direct at anyone who tries to eat too many of my chocolate Turkish Delights. 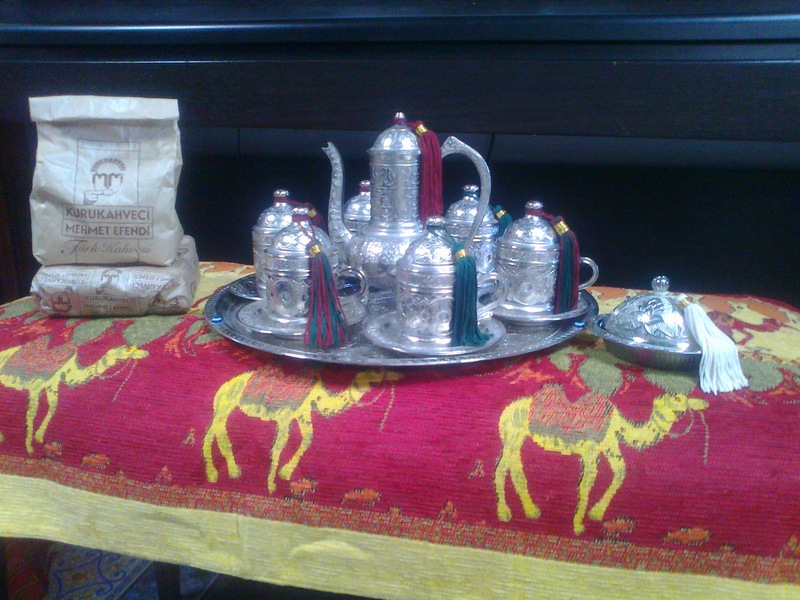 Mehmet Efendi is the best Turkish coffee there is. Or so I am told. Thank you for the kind words Yulanda!